Hi everyone! It's Tuesday and that means another Skipping Stones Designs sketch! Today we're working on Sketch #152 from from fantastic Jen Del Muro! Before you look at this card, I have to assure you that you do not need glasses:) I went for a soft look and that was really hard to capture in the pics (keep looking at the buttons, lol!) I wanted to give the bird flying off into the distance more of a hazy look, so those stamped images are actually under vellum. I'm still not sure about this design, but I am happiest when I'm trying something new:) The images are from Dandelion Dreams, Breathtaking Butterflies, and Timeless Textures. And just for fun, I did up another card! I've been on an ink blending kick lately, and the SSD stamps from Dandelion Dreams really lend themselves to this technique. 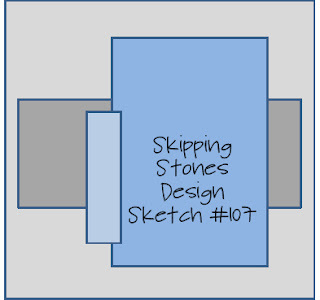 I really hope that you stop in and play along with this week's sketch on the Skipping Stones Designs Blog! One lucky winner will be picked at random to win a free SSD stamp set! 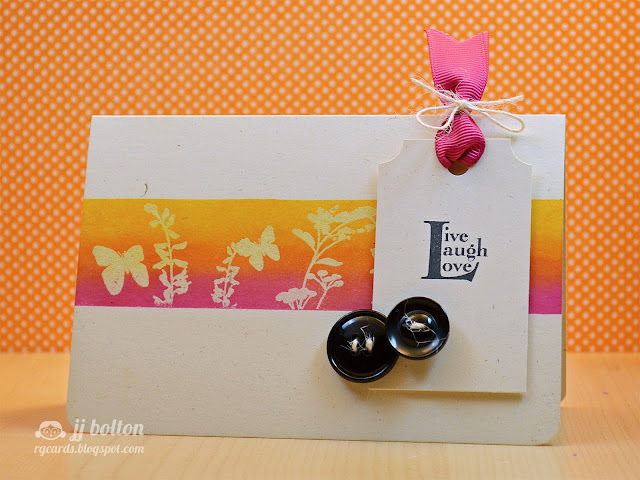 Don't forget to check out what Miriam is up to today (she's playing along at SSD as guest designer for October too)! This has been a wonderful month playing along with the SSD gang:) Heather and Katie and all the SSD DT have been so wonderful! It's been a pleasure! JJ, Love the bird in flight! Lol , about the buttons. Beautiful cards love the blending on the second one. 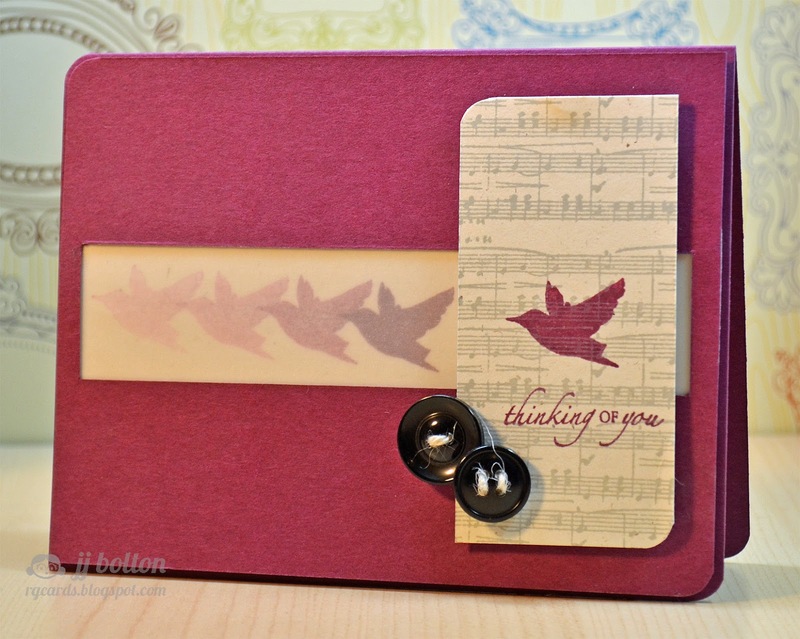 Love your use of vellum on the bird card, very creative! Ohhhh your ink blending is pretty!!! Such pretty cards. I'm glad you told about the vellum--I thought I needed new contacts. Your ink blending is beautiful. Gorgeous JJ! Love how these turned out. My favorite is the second one. It's been so fun to guest with you this month! Glad you're okay out there in all that crazy weather. Really scary stuff. At one point they were forecasting Sandy might hit Bermuda. Seeing what she's done to the US I think there would be nothing left of us if she had hit us! As for your cards I love the "in motion" effect of the birds - it's gorgeous! Love your inking on the second one. So glad you're all ok! And the second card makes me want to practice blending! And you've got it on a one-layer card...I would have a big pink thumbprint on there for sure ;) those silhouettes really are perfect to showcase the colour! This is beautiful! I love the ombre shading on the second one! Wow beautiful JJ! I love the bird in the different shades - it gives so much movement to them and the ink blending has me dreaming of a warm sunny day - a sweet escape - THANK YOU! JJ.....Both of these cards are just amazing! I absolutely love the birds flying "away" and how you stamped them under the vellum! Thanks so much for being one of our guest DTs this month at Skipping Stones!